Many Spartans got into Christmas with Saturday’s Santa Canta at Letchworth on Saturday, a very festive occasion with lots of great costumes. The 5K run was around Norton Common. RICHARD SPRINGALL was second in 19 minutes 32 seconds; JOHN HARRIS top ten with seventh in 20:29 and TIM SABAN 17th in 22:19. YUKO GORDON was the fastest female from Fairlands Valley Spartans, she was 35th in 24:45 with MADDIE PRITCHARD at 49th in 24:45. ROSIE INGRAM was 57th in 25:03. LEE PICKERSGILL came in with 25:54 for 80th. 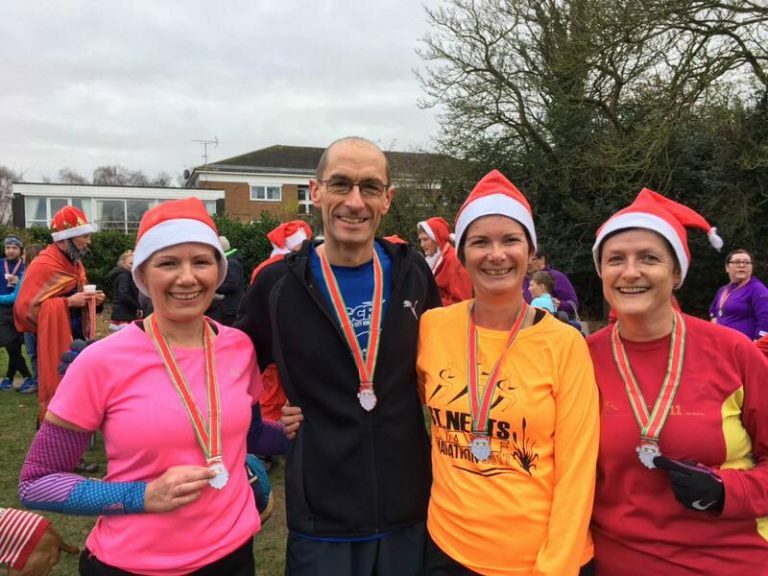 He was followed by KAREN PALMER, 28:01; ERICA GRAYSON 28:12; VICTORIA BRETT 28:56; CLAIRE HYDE 29:24; CAROLINE CROFT 29:59 and KAREN BROOM 31:49. Sunday’s Perivale Five was on a lovely course which ANN TRYSSESOONE covered in 39 minutes 24 seconds. DAVE STEPHENSON ran the Victory Five, Portsmouth in 36:56 with TESSA STEPHENSON in 42:18. With four weeks to go 234 different Spartans have at least one event completed in the short championships and 153 in the long championships. ALISON WOOD leads the women’s short distance championship with an amazing 84.5%. There are long and short distance championships for men and women. The presentations will be made at Fairlands Valley Spartans’ Annual Dinner, Presentation Evening and Dance on Friday 23rd February. There was a Spartan double at Stevenage parkrun as CALLUM STEWART was first male finisher in a new course personal best (PB) of 16 minutes 44 secondss and NATALIE LAWRENCE was first woman in 22:26. For the men NICK GILL just missed a top 10 position, finishing 11th in 20:48 while VERITY FISHER was sixth woman in 23:21. There was also a new course PB for CHANTAL O’FLAHERTY in 49:00. Fairlands Valley Spartans will be going into the third race of the cross country series with their women 8th out of the twenty teams – up from 12th, and their men fourth, up from sixth after the first event. The race will be at Willian at 10a.m. on Sunday 17th December.